A new high efficiency solar cell design that can use almost the entire solar spectrum has been announced by Lawrence Berkeley National Laboratory. What this means is that the resulting solar panels will be able to generate power while it’s dark! What’s more, the new solar technology can be made using existing low cost methods already in operation. A conventional solar cell captures light from one part of the spectrum. This new solar technology uses different materials stacked in layers, which use different wavelengths. Significantly, these include low and mid-energy wavelengths. As CleanTechnica points out, this solar technology breakthrough is just one of multiple paths to increasing solar cell efficiency and lowering costs. Ohio State University is developing a full spectrum solar cell. Stanford University is investigating a new technology that avoids solar cell efficiency loss due to high temperatures, which are of course found in sunny regions such as deserts. Solar paints are also another exciting and promising technology being researched. New processes of solar cell fabrication such as thin-film solar printing are already being rolled out, backed by large amounts of venture capital funding. 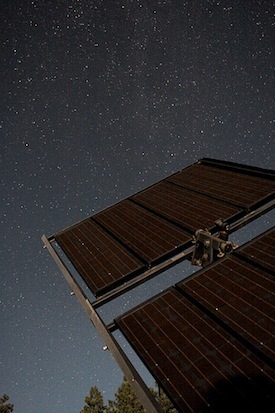 It’s a total cliché to say the future looks bright for solar, but I believe it really does, even in the dark. When you look at the innovation that has occurred in the mobile phone industry during the past 2o years or so (remember Gordon Gekko’s gargantuan brick in the movie Wall Street? ), it makes me wonder what solar technology will be like 2o years from now. the materials are rare ,, rare earths. in some of most of green technologys, im mind full is this.idium and tarllerium. in solar panels etc.gallium arsenic or gallium and nitrates.i don think so.or do i, it should work, even, is as missed matched alloys.as this panel suggest it will be a long time in curculation, as hydrogen compared to expensive alloys,or electric archile heal,lithium,batteries as compared nickle as compared redox flow? or and redoxflow gell. ?.wind generators, mobile phones and touch screens idium. My boss was talking to me about inplix -> http://inplix.com , after seeing it on the news. She said she has saved almost 70% on her utility bill and I’m thinking about giving this new program a shot. Has anybody else used it? It seems to be super popular.